In large bowl, break up cookie dough. Stir or knead in flour until well blended. Reshape into 2 (10-inch) logs; wrap in plastic wrap. Freeze 30 minutes. Heat oven to 350°F. Remove 1 log of dough from freezer. Flatten dough down center with handle of wooden spoon. To form boot shape, with fingers, flatten 1 side of log until about 3/4 inch thick. Cut log into 30 (3/8-inch) slices. On ungreased cookie sheets, place slices 2 inches apart. Flatten slightly with fingers. Repeat with other log. Bake 8 to 11 minutes or until edges are light golden brown. Immediately remove from cookie sheets to cooling racks. Cool completely, about 15 minutes. Spread frosting on cookies. Place small amount of frosting along bottom edge of each cookie; attach candy canes to form "skate blades," breaking off portion of tip of curved end, if necessary. With green gel, pipe laces and outline on skates. Use candy sprinkles to decorate skates. 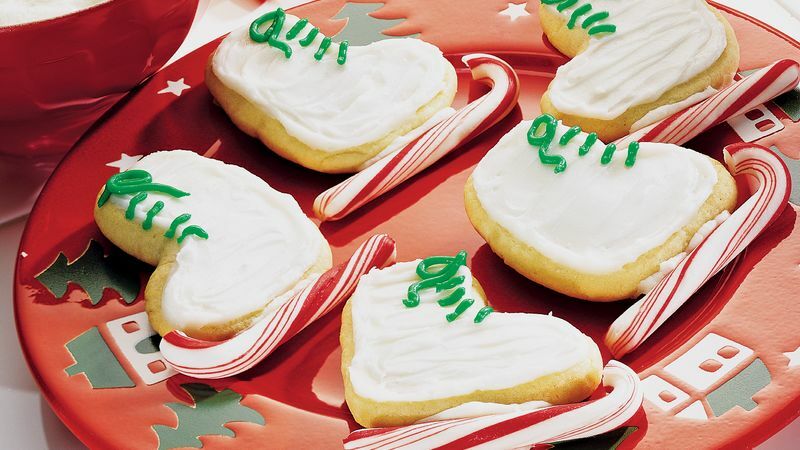 Skip the candy cane skate blade and decorate these tasty cookies as winter boots.